“Vista Cielo” is Spanish for “View of the Heavens” and represents a sophisticated blending of exciting Caribbean architecture and functional modern comforts all perfectly encased in a stylish setting of casual elegance. Vista Cielo is a professionally decorated, fully air conditioned, three (3) bedroom villa with magnificent views from every room. Thoughtfully designed and constructed, Vista Cielo is complete with functional ecological features, a gourmet kitchen and an architecturally magnificent pool. Owner and staff go out of their way to make the visit memorable!!! This villa is located in an exclusive gated community.....upon our arrival, the property manager, Brenda, was the best!!! So helpful and welcoming.....the kitchen was beautiful with every possible amenity.....the pool was one of the biggest we have seen in St. John.....the three separate suites were designed perfectly for privacy, yet still super secure even with children.....air conditioning worked very well throughout.....very close to cruz bay and grocery store, but yet secluded and very private.....we loved watching the iguanas every morning below the villa....we counted 14 one day!!!! My daughter had every one of them named!!!! Thanks to Don for allowing us to enjoy your beautiful villa....the craftsmanship and design of this villa is impeccable! We have stayed at numerous other islands, but this particular villa on beautiful St. John had been our favorite!!!! We have been traveling to the Caribbean annually for the last 10 years and this is by far THE BEST place we have stayed. Everything was pristine from the kitchen to the indescribable view . When we arrived, we were greeted with fresh flowers in all the bathrooms. The 3 private bedroom suites provided separate oasis' allowing for quiet time (if needed). The pool, which over-looked the bay, was crystal clear and warm. The tranquility of the entire property provided the ultimate relaxation get-a-way. Every night we gathered on the balcony (3 to choose from) and enjoyed the sunset. Its an experience ill never forget. As we left for the airport, we all commented on the issue moving forward; we will never be able to replicate this vacation. Between the views, the snorkeling, the ability to find beaches where you are the only one there, I can honestly say no other vacation will be able to be compared to the one at Vista Cielo. Thank you for providing a memory that will last a lifetime, and an opportunity to re-live it every time I go back (this will be a planned annual trip from this day forward)!! I strongly recommend, and urge you, to plan a trip to Vista Cielo. Create memories that you will cherish for a lifetime; there is no other place to do it!!! Stop searching - this is the one! We have been vacationing in St. John for several years and have been searching for the perfect villa. We found it in Vista Cielo. From the three master suites to the well appointed kitchen, it has it all. The layout was well planned, allowing for privacy for each of the bedroom suites. The architecture was impressive and designed for privacy outside as well as inside. It has one of the largest pools we've seen, with a breathtaking view. Having Brenda as a local contact for any unexpected needs was a plus, but not necessary as the villa had everything we wanted. The location is ideal - an upscale neighborhood not far from town or the beaches. You will not be disappointed. Our family has been vacationing in St. John since the 1980's and we find Vista Cielo PERFECT! The house has everything, views, privacy, great location & wonderful management. The house looks exactly like the pictures and is expertly maintained. Three very private master retreats each with extremely large bathrooms, walk in closets, and balconies. I was a little concerned traveling with children and them being in separate areas of the house. There are no worries there. We felt very safe and my children liked having their own space. The house allows for great privacy as well as, very comfortable living areas. The sparkling clean pool is very inviting for swimming during the day or under the starts at night. 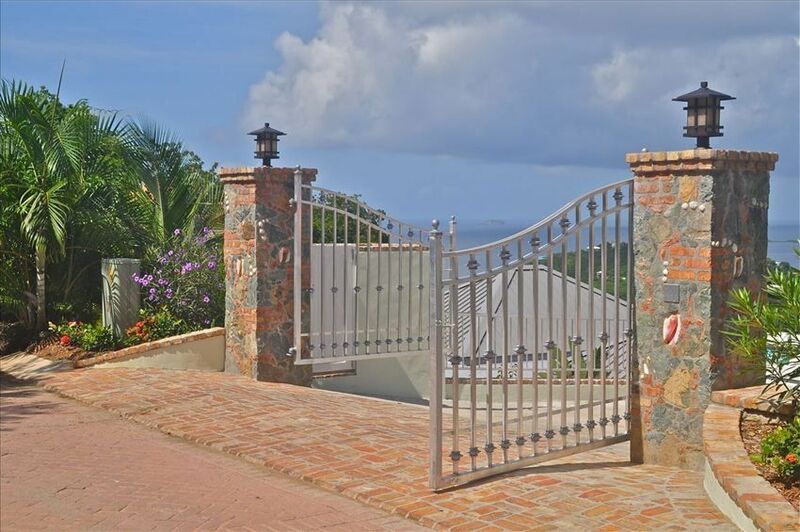 The villas is convenient to all areas of the island to the North Shore beaches, Coral Bay, and Cruz Bay. Not only do we find Vista Cielo perfect, working with Brenda (house manager) and the owner is a pleasure. Brenda is willing to help with and issues and has them resolved in a jiffy, although I do not think you will need much of anything the house is so well appointed. Our family has been lucky enough to have stayed in this villa 2013 and 2014 and we hope to return 2015. My children will not even look at other places after staying at Vista Cielo.